Standing outside the SP’s chamber, I was hell nervous regarding my first interview and that too of none other than but Mr. Hari Prasad Sharma, who recently joined as Superintendent Police of Udaipur a few weeks back. But the way he so easily accepted his short hand in the technical field including blogging, social networking and all, it reflected how down to earth he is. The clarity and the confidence with which he answered my questions, was worth a ‘salute’. Here is the conversation with him. Q1. A very warm welcome to the Udaipur City Sir!! How do you find this city and how are you feeling after coming here? A. Thank you. Udaipur is a calm and serene city. It’s a pleasure to serve the people of this city. Q2. Everyone in the City wants to know about your education and service background. A. I did my B.Sc. in Mathematics in 1979 and then M.A. in Economics. I worked in Reserve Bank of India for one year. Then I joined Administrative Services and served as RPS and DYSP till 1993. Then I became IPS in 2001 and worked with United Nations for 1 year. After that I became SP Jhunjhunu, SP Ajmer, SP Jodhpur, and SP Nagaur and then got posted in Udaipur. Q3. After joining as SP of Udaipur, what are your priorities or the areas of focus? A. Firstly, we’ll try to speed up the investigations and provide the population with a better and unbiased system of justice and administration. Secondly, we’ll make sure that there is a reduction in the number of crimes in the city. Q4. “Tourism is the spine of Udaipur”. What will you do to provide a secure environment to tourists? A. Basically, State Tourist Board deals with the matters relating to tourism. But in a working system, it becomes a job of local police. I’ll try to help tourists in every possible way and see to their security. Q5. From past few months, there has been an increase in the number of crimes ranging from Chain Snatching to land-mafia and alcohol smuggling. People got no satisfactory results from the interventions taken by police against these crimes and criminals. What will be your strategy to deal with them? A. It’s always the easiest job to sit in the couches and blame the system for not functioning effectively. But people need to stand over the ground of facts and then speak. According to India Today analysis, Rajasthan holds the fourth position in the list of peaceful states, only after Gujarat, Himachal Pradesh and Kerala. In the last 15 days, I have myself gone through the records of the city and found that there has been a minimal increase in the crime rate. Still I and my department will work to control the crime. See the situation today and see it after 2 months, compare them, and then you will no longer ask this question. Q6. Sir, maybe the communication gap between the general masses and the police is the reason that people are unaware of the measures and the steps taken by your department and that’s why they are not satisfied with the working system. A. Obviously this gap will be visible when you have only 2619 constables and a few inspectors and officers for a population of approx 32 Lakhs. Q7. Udaipur is no longer a peaceful city as it used to be, reason being the growing traffic. How are you going to manage this terrific traffic? A. Traffic management can never be successful unless the drivers themselves follow the traffic rules. If you wish to have a swift traffic as in European countries, then you need to drive like Europeans. They don’t even break the red light at midnight with not even a single vehicle around and we can break red light even with hundreds of vehicles around. Q8. Female feticide is a serious matter of concern even for Udaipur. How will you work to stop it? A. Female feticide is a social problem. Neither Police nor any law can save female fetus from being killed in the womb itself. People need to be educated; awareness must be spread. This is the only single way of combating this problem. Q9. Most of the time, undue political pressure and interference of politicians hinders the effective functioning of police department. Your comments on this matter? A. Politicians in Rajasthan are quite good and away from those political games. Moreover, it depends on the officer whether he wants to do the right thing or not. No one can hold your hand and make you sign on a wrong document. Q10. What motivated you to join police services? A. In a small area near Jaipur, Administrative services and police department are the most respectable professions. That’s why I joined Police Services. Q11. Any message for the people of Udaipur? A. People should have civic sense and must bind by the law. Moreover, they should have faith in the Department and I hope to have their support with me always. And I wish UdaipurBlog.com, all the very best to excel as an online media, effectually acting as a bridge between the administration and the people. Article Contribution: Munmun Rajora, Drishti Soni | Photograph By: Mujtaba R.G. मुझे तो नए एसपी साहब से बस इतना पूछना है कि ठोकर, चेटक पर इतनी पुलिस क्यों लगा रखी है, और वो भी वेपंस के साथ ? Its a nice initiative…..the ppl will came to know abt the main-stream officials of the city and their thoughts . 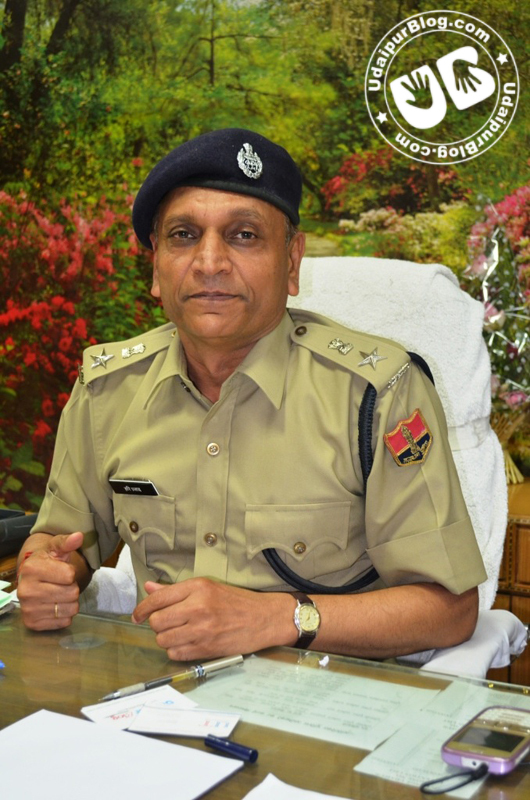 Its good to know abt the new SP of the city…welcome to udaipur sir and I wish udaipur will gain many things in your work tenure…. he will be the best sp of udaipur. this is lucky city.